Millennia Designs tapestry and needlework kits draw their inspiration from classic designs across history - from the art of the Ancient World, Egypt, Rome, Persia and Byzantium, through to the Arts and Crafts movement of the Victorian era. Our tapestry kits are all manufactured to the highest standards in the UK using only the top quality branded materials. All our historical tapestry kits are available on a full colour printed Zweigart tapestry canvas, but most kits are also available with an unprinted canvas and a chart - your choice. The choice of tapestry wool used in each kit is carefully selected to match the design: Appletons Tapestry wool for a traditional aged look and Anchor Tapissery wool for bold colours. The printed tapestry canvases are also available separately if you wish to choose your own wools, for example to vary the background colour. 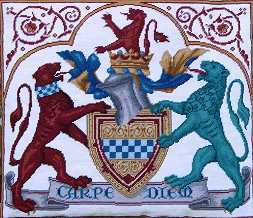 All our tapestry and needlwork kits are supplied with sufficient wool to complete the design in half cross stitch. If you don't have sufficient wool for some reason, please contact us. If you prefer to use a different tapestry stitch, such as tent stitch, please get in touch as you may need extra wool. We are happy to provide additional tapestry wool so that you can complete your kit and don't usually charge. 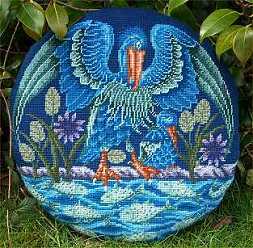 Millennia Designs: Fine needlepoint and tapestry kits inspired by the past.